The man has been warned numbers of times. He has been told to toe the line and he makes the same mistakes over and over. I've seen the other bloggers and their name calling. "Knucklehead," "Idiot," "Clueless," "Immature," and worse. A lot of those names are justified. Here is my advise to the troubled Dodger outfielder. 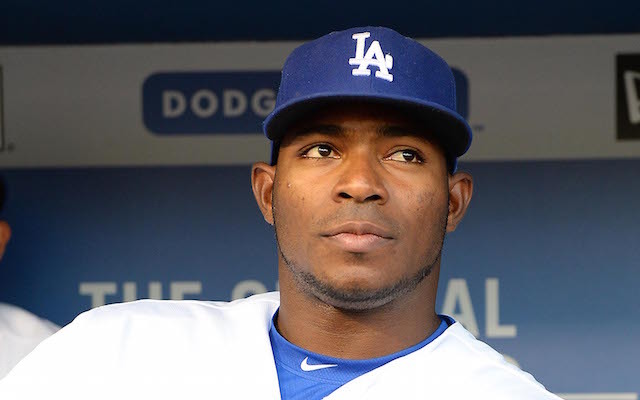 "Yasiel, alejate de las discotecas, y la bebida..."
Puig needs to steer clear of bars and clubs. Additionally, he needs to be kept from getting behind the wheels of automobiles. Now he may need to be told to stay away from his own family members. All seem to be a rather toxic situations for him. Get him to lock himself on his compound with his personal trainer and get in shape both physically and mentally. If he doesn't, his career will flounder and eventually fizzle out. The truth of the mater is Puig is seriously blowing it and his hopes of landing future earnings in the hundreds of millions of dollars are getting slimmer as time passes. With that said, Yasiel Puig's value as a player has reached all time lows, which is the precise reason that the Dodgers should NOT trade him. It's not like the Raiders are in MLB. But I guarantee you this, if a team could have him for next to nothing, there are a number of them out there that will probably attempt to strike a deal with the Dodgers. Puig would comes to them super cheap. Five tool players with a ceiling in the stratosphere are not easy to find. Players of that ilk making 7 million/year are just not out there too often. Remember, he's still not 25 years old until next month. It would be borderline stupid to deal him now. Puig could be a bust and never surpass his amazing rookie season. In that scenario, the Dodgers lose out on the $23 million he is owed over the next three years. Either that or the marginal player they could get in return for him if he was traded tomorrow. Neither is that great a loss. The Dodgers spend much more that $23 million on scrubs, scrapped and injured players year in and year out. On the other hand, Puig could also turn things around, work hard and be an MVP candidate for years to come. The risk/reward needs to be fully evaluated when considering losing Puig now. Do the Dodgers want to be looking back ten years from now saying "what if" we hadn't traded Puig, the former WS MVP and 7 time all-star? All of which is possible. I sure would hate to be thinking of Puig as we currently remember Hall of Famer Pedro Martinez today. At age 25, it is silly to even consider the fact that this grown man still is in need of a mentor on the team that serves as his babysitter, something that Juan Uribe did fairly well. The man needs to grow up, and maybe a dose of humble pie will do that. Is that a minor league designation? I surely doubt it, but this will be the first true challenge of the new manager, Dave Roberts, a man that everyone lauds for his in-person skills with players. Meanwhile Yasiel Puig needs to remain a Dodger. He needs to arrive at Spring training svelte and in the best shape of his life. He needs to buckle things up. Stop partying and get serious about his career. If he doesn't, his days as a Dodger are done, and he'll become that "what if" story that will be talked about for years on end.